Have you known from a young age that you were blessed with a powerful gift, but aren’t quite yet sure as to how that gift aligns with your place on this earth? Are you looking to come into contact with your Highest Self, and connect with your Divine Path? If so, my Simple Ritual: Find Your Purpose Set is for you. For this ritual set, I’ve hand-picked several energetically potent tools for leading you to your Highest Calling, your soul purpose – the path that your soul was meant to walk. The first tool that you will receive in this set is one (1) small purple candle, anointed with my Dharma perfume and infused with a fluorite chip stone. Purple is such a powerful color for opening up our Crown Chakras, for deepening our connection to Source energy and All That Is. This color represents our regal, Higher Self that is in alignment with Spirit. 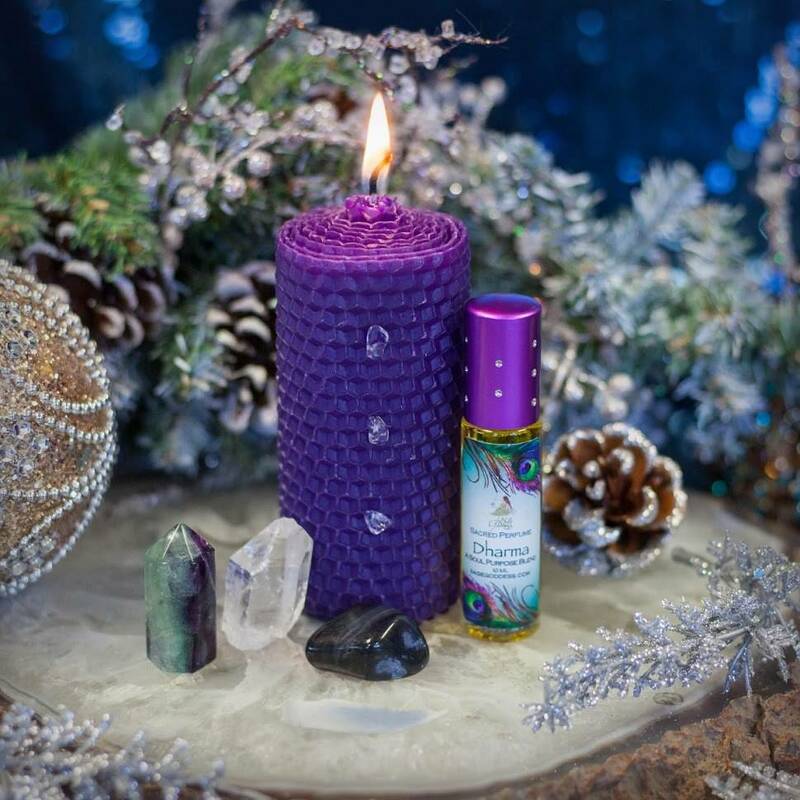 By incorporating this purple candle into ritual, you will be able to connect with your angels, and unlock your Divine Purpose once and for all. Next, you will receive one (1) fluorite generator, approximately 1-1.5” in size. Fluorite is the great pathing stone, and its power is pure, Higher Realm magic. This generator is vibrating with frequencies that are powerful for visioning and manifestation. When you incorporate this fluorite generator into your altar and ritual, you will harness its vibrations of optimism and determination, and send that energy powerfully into your space. This gem will show you where to go, how to proceed, and whom to ask for help, so that you may journey with confidence toward where you are meant to be. Next, you will receive one (1) clear quartz point, approximately 1” in size. Clear quartz points are used for magnification, intensification, sealing of intentions, gridding of altar or sacred spaces, and holding sacred space. This point will amplify the intentions of the other magical tools in this set. Clear quartz is associated with the 8th, or Soul Star Chakra, connecting you more deeply to Spirit, and the place and purpose that Spirit holds for you on this earth. You will also receive one (1) piece of botswana agate, approximately 0.75” in size. Botswana agate is a stone of transformation and manifestation. This stone invokes the creative muse within, supports you in uncovering solutions to difficult problems, and helps bring your unique gifts into the world. When used in ritual, this stone will allow you to tap into your deepest purpose, and manifest that into the physical realm. Lastly, you will receive one (1) 10 mL roller bottle of my Dharma perfume. “Dharma” is a Sanskrit word used in Buddhism and Hinduism, and roughly translates to “natural law” and “sacred duty”. Dharma is that which upholds the natural order of the universe, that which governs what purpose on earth we were meant to serve. I created my Dharma perfume to connect you with your own ancient wisdom, and discover who it is that you are meant to become. With notes of white amber, hibiscus, and hyacinth, this perfume is intoxicating, and is an incredible potion to anoint your major pulse points and seven Chakras with during ritual. Meditate with these tools and use them in ritual to connect with your soul purpose more deeply than you ever have before. Once you’ve used this set, all will become clear, and you will be able to proceed to where you are meant to be. Dear ones, the Universe is calling for you – so tell me, are you ready? Note: Please always burn candles on a heat proof stable surface, and never leave a burning candle unattended. Your perfume is made with natural essential and carrier oils, and may contain fragrance oils. Cap color, chip stone, and color may vary slightly. For external use only. This listing is for one (1) Simple Ritual: Find Your Purpose Set, as described above. Yours will arrive beautifully packaged, ready for sacred work or gifting to a loved one. You will also receive a parchment describing the properties of each the gemstones in this offering. May you heed the call of the Universe, my loves, and come into alignment with your soul’s Highest purpose. Absolutely love the simple ritual set! I am just starting my self discovery journey and had no idea where to start. Found this and it really changed my life. I am finally able to feel the energy and magic around me! Thank you Athena and the Sage Goddess team!! I bought this for my sister and she LOVED it. She used the tools and and got her dream job!!! At First, Dharma smells like a fruit stall in a rainforest, but there’s a fresh yet musky dry down that is soft and comforting like a blanket dried in the sun. When I wear it, I feel redirected, part of something bigger. I used the set as part of a spell and it was followed by a series of changes for the better. Lovely stones, too. Especially love the perfect clear quartz sphere! This set is amazing. The fluorite generator has got to be the most stunning stone I’ve ever seen. The Dahrma perfume is soooo beautiful it’s almost addicting. Highly recommend this set! This set is an absolute must for beginners and trying to find their true purpose. I have used it and feel the energy…… love it!! This ritual is perfect for beginners, having the parchment is an added bonus and really assists. I must say the second day after use my soul started to speak to me; literally and through energy. I now know my souls purpose, my husband even enjoyed using it! Thank you Sage Goddess, I love your products! This is such a beautiful and energizing set. Dharma is such a wonderful fragrance. Setting some intentions. ..I love Sage Goddess. Thank you for all you do!